Just in case you want to know why the Second Amendment is important, consider what happened in Georgia. An intruder came in the house, and a woman with her two children hid in a crawl space before the perpetrator opened the door. The woman unloaded her gun and nailed her potential assailant with five shots to the chest. When she realized she was out of bullet, she fled with her children to a neighbor’s house while the assailant tried to drive away before crashing his car and being apprehended. There are several lessons for the gun debate. First, all of those assault weapons may have benefit for self-protection. The woman nailed the robber with five bullets, but he survived. Instapundit Glen Reynolds quipped that in this case, bigger guns and more bullets was called for. Pundit Bill Quick noted, “I’m re-thinking my notions about 'adequate' self-defense rounds. . .357 and .45 are looking like the most viable options now. Preferably in something that shoots at least ten of them.” As Quick and others observed, the police were minutes away, but if she didn’t have a gun, she may not have survived until the police arrive, for every second counts. This is not to say that every story like this will end in a similar style, but it points out that there are two sides to the debate. First, being that we need to regulate and control gun ownership, and the second is to respect the constitution in allowing the individual right to own a gun. As I have mentioned and so far, no critics have been able to challenge the fact that there is no evidence that carry and conceal laws will increase gun violence because the facts are on my side. Violent crime has been reduced over the past decade, and this is a time when many states have passed carry and conceal weapon laws. The second aspect is that not one law being proposed would have prevented Newtown massacre, and that is a fact! So we are looking at passing laws to reduce our liberties to deal with a crisis that no laws will prevent in the future. Finally, many communities like Chicago have strict gun laws and crime is still up. Gun control is not a solution if increased safety is the goal. The real goal for the left is to eviscerate the Second Amendment and beyond that, the Constitution. Georgetown Professor Louis Seidman wrote, “As the nation teeters at the edge of fiscal chaos, observers are reaching the conclusion that the American system of government is broken. But almost no one blames the culprit: our insistence on obedience to the Constitution, with all its archaic, idiosyncratic and downright evil provisions.” For the left, the real target is the Constitution itself. The attack on the Second Amendment is just one aspect of the left's assault on Constitutional rule. For the past year, I have made the point that our Founding Fathers believed that our rights were derived from God and not gifts bestowed by government. The left believes that rights are mere gifts provided by the State. Rights provided by the State can be reversed by the State if they are no longer required by the State. We are having a debate on the nature of our Republic. Are we a Constitutional government in which government is limited in its authority or a government in which government becomes all persuasive. 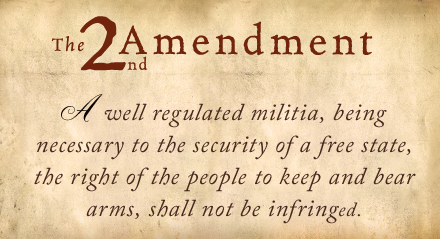 The debate over the Second Amendment is a debate over the extent that liberty will be preserved. We are one Supreme Court vote away from having no individual rights to own a gun. We are one vote away from seeing our political free speech from being diminished. (Citizen United was a case where the government through the FEC tried to prevent a non-profit from showing a movie on why Hillary Clinton shouldn’t be President.) The gun debate is a debate about the Constitution.